Don't get stuck trying to figure out how to lift the cooking grid off of your Primo ceramic grill. 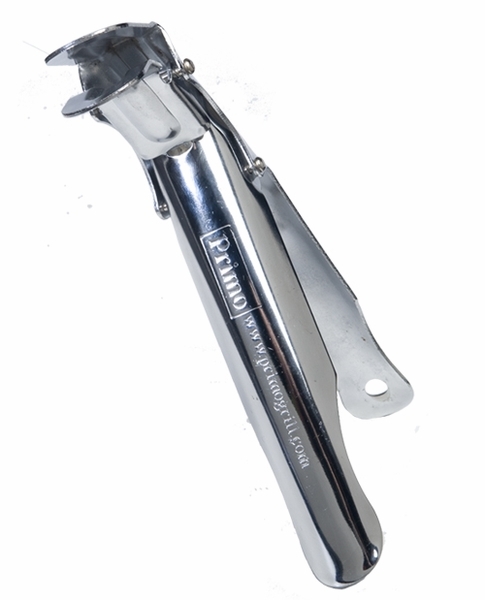 The Primo Grill Lifter for Primo Ceramic Barbecue Grills makes it quick, simple, and safe. Get your cooking surface off of the grill, even when it's flaming hot, in one quick motion. WARNING: Burning charcoal in this product can expose you to checmicals including carbon monoxide which is know by the State of California to cause birth defects or reproductive harm. For more information go to www.P65Warnings.ca.gov. The Primo Ash Tool makes removing grills much easierâ€”whether theyâ€™re hot or cold. Tip: Keep it out of the rain or it may rust. The grill lifter works fine, but a pair of channel lock pliers would do just as well. This is really a very simple tool, but itâ€™s perfectly designed to do the job. I own the Big Green Egg, and the shape of this grill lifter makes it easy to add charcoal. And it keeps your hands clean too! Got the product on time. Now that I have it, though, Iâ€™m thinking that I could have used vice grips I already own to do the same job. I suggest you donâ€™t purchase this but save your money and use pliers or vice grips instead. This is just a basic tool, and it does the job of moving hot grill pieces just fine. Donâ€™t leave it out in the rain, thoughâ€”it might rust. If you donâ€™t have this tool, the grates are much harder to handle. I wish it had come with the grill when I ordered it, though. The price is right on this itemâ€”but donâ€™t leave it out in the rain! Parts of it can rust. I would say this gizmo is a must-have if you own a Primo Kubocha Grill. You use it to move very hot grill pieces without burning yourself.